"14 hours, 20 people, 1 all-new sketch comedy show written, rehearsed and performed in a single day. It's SKETCH CRAM! Every month UCB's top writers meet on a Saturday morning and begin writing the show from scratch. UCB's best performers arrive that afternoon and start rehearsing. The show goes up at midnight no matter what! 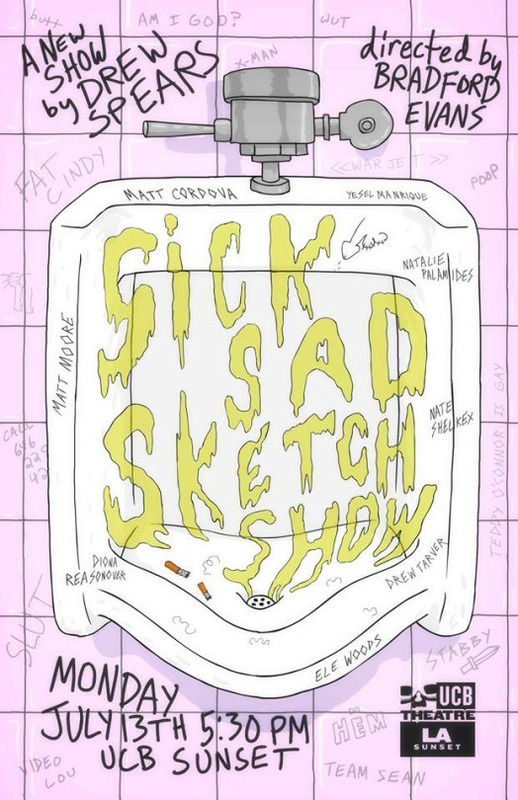 SKETCH CRAM is all the comedy you can cram into a single show in a single day. Featuring 100% new content every month!" I'll be telling/talking through a story with Timothy Simons and ManCamp at the Meltown. Join us for what will inevitably be friends razzing each other in front of other people. Plus, look at that dynamite line-up. SWISH! $8 in advance, $10 at the door. Click here to buy online. Our theory: Comedians are never as funny on stage as when they are with their friends. Our logic: We invite them to tell a story with their best friend. Comedy during the day? Will it work? Who knows?! What I do know is I'll be performing Tom Dunn's "Magic Dad" at this matinee, so come on down an learn about the magic of selling real estate. Read more show info HERE. I'm participating in an updated Spank! show called GILF & The Hot Rods (A Wedding Band Reunion Show). It's real fun. Check it out. Doing some physical comedy again at this show. You should come. The first one was a blast. It's going to be great. Only $5. "Talk is cheap and we don't need words to do comedy! Come take a trip back in comedic time with The Sound of Silence. The Sound of Silence is a completely silent, non-verbal comedy experience. Not one word will be spoken." I made the final for the Montreal Just For Laughs new faces character showcase in LA. Come see me do some of my favorite characters including an appearance from your Aussie mate "Rick." We both would love to have you. Robert and I will be reading and signing copies of our book Adult Stuff at Book Soup on the Sunset Strip. Come on down to hear my reading voice, have some laughs, and see how illegible my signature is. Adult Stuff on shelves April 5th. Pre-order now on Amazon. From Sourcebooks Publishing. See Robert and I inspire Dr. God improv while we discuss adulting and our book Adult Stuff. I'll be doing a live character showcase for consideration in Montreal's Just For Laughs new faces showcase. Yeah, it's Santa Monica. At 6pm. But if you're around, you should come anyway. I'll be there. AND handsome. Tales of Male Folly - storytelling show. Featuring stories from Pete Capella, Eric Edelstein, Deepak Sethi, and me. This sketch show is real weird and real fun. More dates to follow! Stay tuned (people still say that?)! Robert & The Magic Mirror is making it's highly anticipated (depending on who you ask) return! We'll be running a new and improved episode of Deep Space Nein! directed by Becky Feldman. This show's got it all: Robert, the Magic Mirror, creepy Richard Branson, and a sassy super computer. Featuring live musical accompaniment from our pals in CityCity. Come see our Spank show. $5. I'm doing some physical comedy in the Look At Me! (solo variety showcase) the first Wednesday in June. Solid line-up, hosted by the wonderful Alana Johnston and SNL writer Alison Rich. Performing a few characters in consideration for the Montreal Just For Laughs comedy festival. This is the final audition for the "New Faces" category so it will be a solid set of great character performers. 5pm is a tough slot on a Monday, but if you can make it out, it should be a hoot. Come check it out, friend. A sketch show based on the unsolicited ideas pitched by writer's family members. Doing a bit by Allegra Ringo. This show is going to be great because, like, our families are terrible joke writers. Musical Shia-Prov: Celebrating the career and characters of Shia LaBeouf. Come check out this improvised Shia Musical! Debuting new characters for the 2015 Montreal Just For Laughs showcase.